The Earlex 0HV6003PUS Spray Port 6003 HVLP Sprayer is particularly designed for the experienced woodworkers and for the professional finishing shops. This 6003 is the next level spray system which has 1200w 3-stage turbine. This sprayer is suitable for thin to medium coat sprays and is also useful for occasional painting purposes. This Earlex 0HV6003PUS Spray Port 6003 HVLP Sprayer is the next level of the early 6002 spray system. This sprayer is survival in power and comes with a 1200w 3-stage turbine. This sprayer is best for both thin and thicker coat sprays, and this is because of its increased production speed and atomization. This spray system is mainly designed for the small paint shops and finishing shops. This is also useful for the individually experienced woodworkers and professionals on the job site. This spray system allows the sprayer to spray coats with show-room quality finish. The turbine of this sprayer is a set up in power and performance over the lower models of this series. This turbine can atomize the coatings whether it is thin or thicker quickly. Additionally, this sprayer has a comfortable and streamlined spray gun. This spray gun is lightweight thus building with die-cast aluminum. Hence it is easy for the sprayer to hold the spray gun and to carry out the spraying task easily. Also, the hose of this spray system is extremely lightweight and flexible. It minimizes the chances of tangles or kinks when using for tight corners. It won’t interrupt the sprayer when they are spraying while moving the gun in all directions. Similarly, the user also has the option of the non-bleeder spray gun. 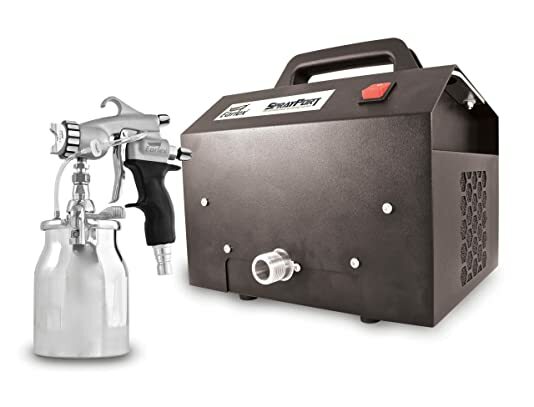 That is, this spray gun of this Earlex 6003 is non-bleed, and one can get the gun in different forms like pressurized cup gun, gravity-fed To or as top gun. In general, the hose is the most neglected component of any HVLP spray system. This Earlex Port 6003 HVLP sprayer has an easy to connect functionality hose. This hose is extremely lightweight, flexible and also resistant to crush which can stand for a long time. The lightweight design of this spray gun is comfortable for the user to hold it while spraying. Also, the excellent and flexible hose of this sprayer helps the user to concentrate on applying the spray. This is because they don’t have the tension to handle any tangles or to struggle with it to get in position. As this is a High Volume Low-Pressure sprayer, it gives good painting productivity. This is because it delivers the coating material in the correct form which makes the spraying attain its expected finish. Similarly, the increased atomization feature of this spray gun provides improved production speed. This Earlex 0HV6003PUS Spray Port 6003 HVLP Sprayer is easy to portable, durable and easy to maintain. This Earlex Spray port 6003 contains HyperFlex thermos-vulcanized polymer hose. This hose is lightest and most flexible to use. This is mainly designed for the professionals with quick-connect gun functionality. Even though it is not the most powerful turbine in the market, it has enough power to deliver the most excellent finish and helps to achieve the spray efficiently and effectively. The 1,200-watt, three-stage turbine of this sprayer can deliver 5.5 pounds per square inch of pressure to the gun. This is enough to spray furniture spraying and other related sprays. This sprayer is available in almost online shopping sites and is used by a lot of customers. The customers those who used this sprayer provide positive feedback for this sprayer. As per the different customer reviews and ratings that are provided, this Earlex 0HV6003PUS Spray Port 6003 HVLP Sprayer got the perfect of a high rating. Thus, this depicts that this sprayer exhibits good functionalities. On the whole, this Earlex 0HV6003PUS Spray Port 6003 HVLP Sprayer has the unique design for the small to medium workers. Right from the turbine to the hose and the gun this High Volume Low-Pressure spray system is built with rugged quality and ease of use in mind. The compact design of this sprayer makes it easy for the sprayer to carry out the painting task. Even though there are a lot of different sprayers in the market, this Earlex Spray Port 6003 HVLP Sprayer provides the best possible functionalities to achieve the maximum finish. Small and medium woodworkers and individual professionals avail more benefits by using this spray system. With this conventional spray system, one can achieve natural spray. It provides a lot of benefits to the sprayer. Also, it offers a safer painting environment to the sprayer, and only fewer materials will be needed to do the spray job. Hence, those who want to achieve an economical spray job can buy and make use of this Earlex spray gun.